Anaglyphic Inserts (Sun) - American Paper Optics specializes in manufacturing 3D inserts for magazines and newspapers. 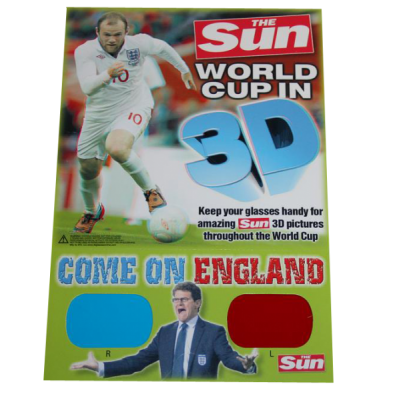 In the Summer of 2010, we manufactured 4,600,000 3D inserts complete with a 3D image of England's biggest soccer star. These inserts were blown into the London, Irish, and Scottish Sun for the launch of the World Cup. Anaglyphic Inserts (Maxim) - American Paper Optics specializes in manufacturing 3D inserts for magazines and newspapers. 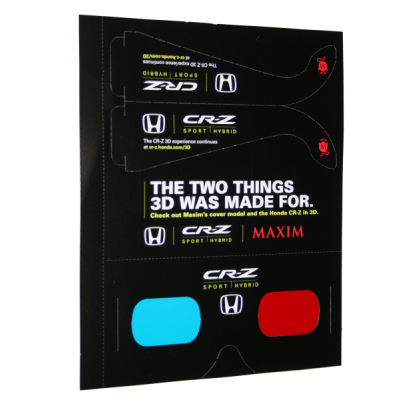 We recently produced 3,300,000 inserts for the October issue of Maxim Magazine featuring tennis star Anna Kournikova in 3D.